The Ionian Islands are a group of islands of continental origin, located along the west coast of Greece. According to many the archipelago is considered the most beautiful part of the country. The islands stretch more than 500 km in a north-south direction. The northernmost islands are located not far from Albania while the southernmost parts of the archipelago reach almost the island of Crete to the south. The Ionian Islands consist of six larger islands – Corfu (Kerkyra), Zakynthos, Lefkada, Kefalonia, Ithaca and Kythira as well as a large number of smaller islands, some of which are well known tourist destinations. Probably the most popular of the small Ionian Islands are Paxos, Antipaxos, and Skorpius. The bigger Ionian Islands are one of the most attractive places to live in Greece. Most of the expats come to the Ionian Island because of the mild weather. Indeed, the geographic location of the islands talks about the type of climate you can expect moving there. The climate over the archipelago is characterised by long warm summers and short mild winters. From early May to late October you can expect temperatures of over 23 °C, reaching 31 – 32 °C on the shade in July and August. Nights are pleasant from June to late September with temperatures of around 16 – 19 °C. The winter season lasts from November to April and brings temperatures between 14 and 19 °C during the day and between 5 and 10 °C at night. If you are considering the idea to move here for permanently, however, you should know that the climate here is much more rainy than on the Greek Islands in the Aegean Sea. The Ionian Islands attract new settlers from all around the world, and especially from Northern Europe, mostly because of their beautiful nature. Unlike the islands in the Aegean Sea, most of the Ionian Islands are known for their lush vegetation. Due to the more humid and rainy climate, they are covered with thick olive and pine forests. If your idea of a good time is something like hiking, biking and exploring the nature, then the islands will be for sure a real paradise for you. The beaches you can find on the Ionian Islands are not just the best in Greece. They are actually among the best in the world! It is hard to describe in words the out of this world beauty of the local beaches. It is something you have to see and feel. The most famous beach is definitely Navagio Beach on the island of Zakynthos. However, the Ionian Islands offer thousands of other beaches that are not less beautiful and just wait to be discovered. What is the most impressive is the unforgettable blue color of the water as well as the beaches covered with small and white oval pebbles or large-grain white sands. Usually most of the tourists prefer to visit the Ionian Islands in July and August, during the height of summer. However, living here you will find out that the beach season here is much longer and the weather is actually much more pleasant in June and September for example, when the temperature is not so high but the weather is still great for swimming and sunbathing. In fact, the beach season here is approximately six months and moving here you can expect something like summer season from early May to late October. Sometimes even in April and November there are some very good days for the beach but as a whole April is a bit cool and November is too rainy. The average sea temperature in May is between 18 and 21 °C. Even if a bit refreshing, the water is already good for swimming, at least if you are not too sensitive to cold. June is not only one of the most beautiful months on the Ionian islands but it also brings sea temperatures of between 21 and 25 °C. The average sea temperature in July is different from one year to another but is usually between 24 and 27 °C. The sea temperature in August is generally the same as in July. It remains relatively stable throughout the month and is usually between 24 and 27 °C. In September you can feel a slow decrease in the temperature from 26 – 27 °C during the first week of the month to about 24 – 25 °C during the last week. The water is still perfect for swimming. October starts with sea temperatures of around 24 °C but the water slowly cools down to around 20 °C during the late October. Because of their specific location between the Balkans and the Apennines, the Ionian islands are a kind of a cultural bridge. They are not exactly the typical Greek Islands because they also have some characteristics typical for Italy. Also, unlike the rest of the Balkans, the Ionian Islands were never conquered by the Ottoman Empire but were strongly influenced by Venice and later by England. Today, this group of islands is considered by many the border between the East and the West of Europe. The Ionian Islands are not just nice weather, beautiful beaches and lovely nature. One of the great advantages of living here is the food. If you want to put on the table high quality products every day, you should definitely consider to settle down in Greece because this is one of the culinary hubs on the planet. If you move to the Ionian Island you will be able to enjoy cheap local fruits, vegetables, fish, cheese, milk, honey, olives and olive oil, meat products and many others. The Ionian Islands are well known as a safe destination with very low levels of crime. This is not surprising, especially given the fact that the islands are popular place where millions of people from around the world want to spend their summer holiday. For this reason, the islands are also very good place to live and a great place to rise your children. Even if a bit crowded during the summer season, the Ionian Islands are very idyllic and quiet over the rest of the year. But if you want to find a beach just for you, it is not impossible even in July and August. Usually most of the tourists visit the beaches in a close proximity to the resort towns, so if you have a car, you can always find some remote place to have a calm day on the coast. Another advantage is the clean air. The islands are not industrialized and the traffic is very different from what you can see in every big or average city in Europe. If you live on the Ionian Island, it would be better if you have your own car. Indeed, the towns are small and you easily can reach from one point to another but on the other hand, you will have to often travel to another town or village to buy something or if you have some work for example. In these cases you will definitely need a transportation, and it is always good if you rely to yourself. 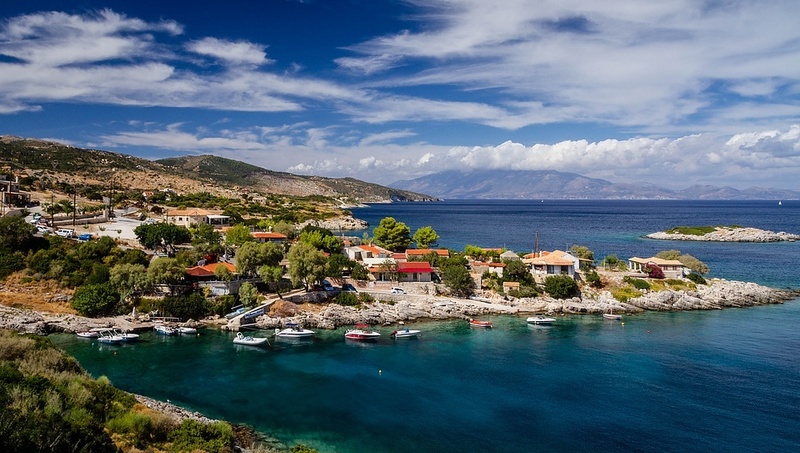 Are there many expats living on the Ionian Islands? The Ionian Islands are a peaceful place with a small population. In 2011, their population was 211,896 people – this is approximately the population of a medium or even small European city. This includes and population of 4041 people on the island of Kythira, the most distanced island, which lies between the Peloponnese and Crete. The islands are not evenly populated and almost half of the total population (about 102,071 people) is concentrated in Corfu, where you will find a large diaspora of British settlers. Actually, Corfu is the most popular place for expats to live and their number is constantly growing. On the island live also Germans, Scandinavians, Russians and many others. The islands of Zakynthos, Lefkada and Kefalonia also enjoy constantly growing popularity as a great place to live. There is, however, something you should think about in advance – many of the expats leave the islands for the winter season and return again in spring. Is the Greek economic crisis a problem for the expats? In most cases, no. The Greek crisis has very few in common with the lives of the expats. If you have incomes from your business in other European country, or if you take a rent, or of you are retired for example, you will even find out that some goods and services are cheaper than before. However, if you want to start your business here, it is recommended to be careful and to consider all the pros and cons. But even if affected to some extent by the long years of crisis, the Ionian Islands are a magnet for well-off tourists. For this reason, if you are planning to start a business here, it could be very successful as well. Do not forget that the Ionian Islands are one of the most developed and rich provinces in Greece. What is the currency of the Ionian Islands? The Ionian Islands are part of Greece, part of the European Union, and part of the Eurozone. The currency here is Euro. If you are planning to come to live here, you have to know also that local people always prefer to pay for goods and services in cash even if you can do that with your credit or debit card as well. What is the best Ionian Island for me? Each of the Ionian Islands has its own advantages. It is a fact also that the different people appreciate the beauty of the Greek islands differently. Corfu for example is the most cosmopolitan of all the Ionian Islands and is the most famous of them. It offers the opportunity to meet many other expats like you. For this reason many people prefer to live there, especially if they consider to spend the winter season here. Another out of this world jewel is the island of Lefkada. They often describe the island as the most sophisticated and chic. Even if less famous than Corfu, Lefkada is sometimes considered even more beautiful. It is located just off the coast of mainland Greece so it is also very easy to access. The island of Kefalonia is known as a very unspoiled and picturesque place. It is very diverse and at the same time is rarely populated. It is a great place if you want to be far from it all. While all of the islands are famous for their great beaches, Zakynthos is the most famous in this respect. It is picturesque, green and quiet. At the same time during the summer season the island is an attractive tourist center and thousands of tourists spend their holidays here. If you consider to move on the Ionian Islands for permanently, it is deeply recommended to visit all of the islands in advance and to collect your own impressions. Even if people recommend to you to settle down on one of the islands, you should see the place with your own eyes. Even then you couldn’t be completely sure if the place is really good for you. You will be able to say if you like the place or not after you spend some time living there.